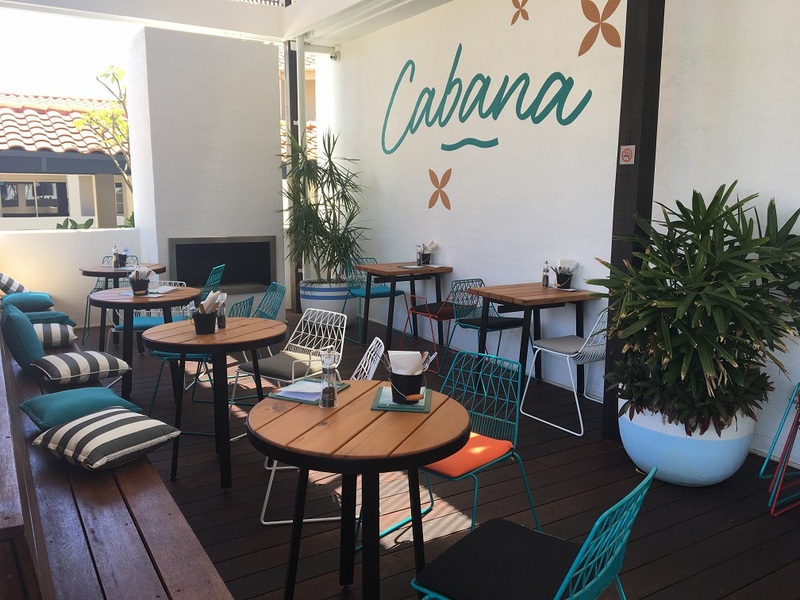 The Cabana Pool Bar and BBQ at the Mindarie Marina is a little slice of Bali right here in Perth, and is the perfect place for the whole family to unwind and enjoy a swim and a bbq inspired meal by the pool, with a full bar for the grown ups to enjoy a sneaky drink or two. It's open Fridays - Sundays 11am til late (Thursdays late Dec to Jan also) and you don't need to be staying at The Marina Hotel to use it! The pool is a good size around 15m x 5m with depth ranging from 1m - 1.6m. While there is no life guard on duty "Watch Around Water" rules do apply with kids 5 years and under to be within arms reach. There is a step on the far side of the pool that extends the full length and entry is via a set of steps at the shallow end. This was a massive hit with the kids (and grown ups) and several families were enjoying the pool while we were there. While there are no rules around inflatables and toys in the pool we recommend you don't bring large inflatables to respect others using the pool. We brought a few dive sticks along, these were a hit with all the kids. 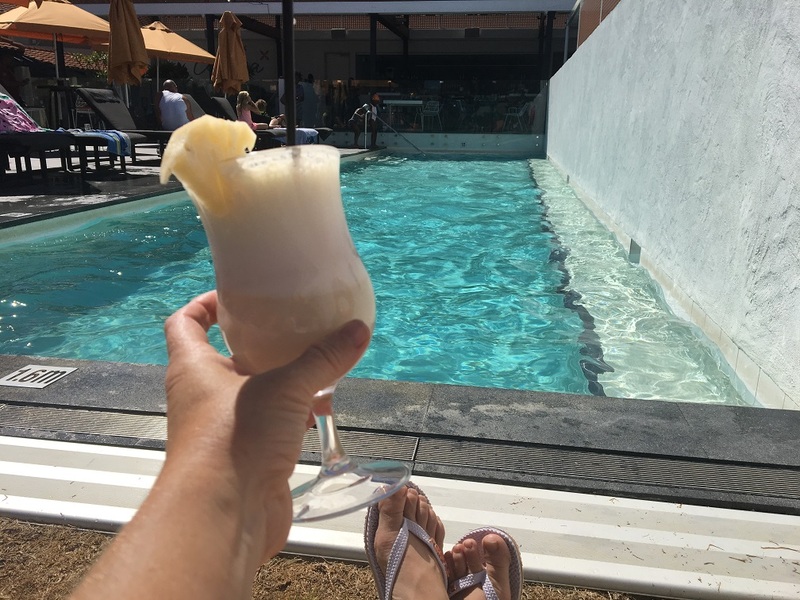 We have been told the Cabana Pool Bar and BBQ can get very busy as the "night life" kicks in, so for a family friendly experience we recommend you enjoy your meal, drink and a swim when it opens at 11am until the sun goes down. We arrived at 1pm on a Friday afternoon and stayed until around 5.30pm. We imagine Sundays may be a little busier too has they host a Sunday Session from 3pm with a DJ on the deck. 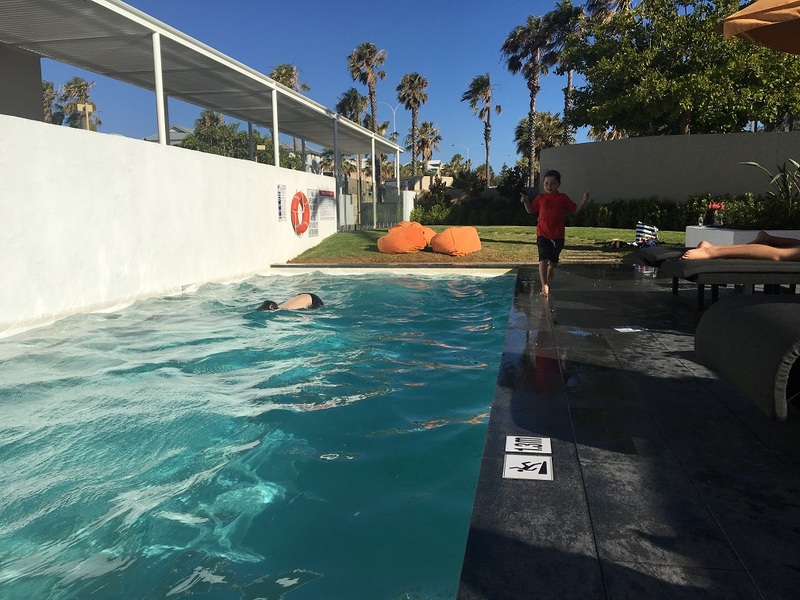 Along the length of the pool are several pool lounges and there is a grassed area with a little bit of shade from the palm tree to lay out a rug or towels or you may be lucky to grab some of the beanbags here. If it's busy be prepared to miss out on shade with hats, sunscreen and ensure you limit your time in the sun. 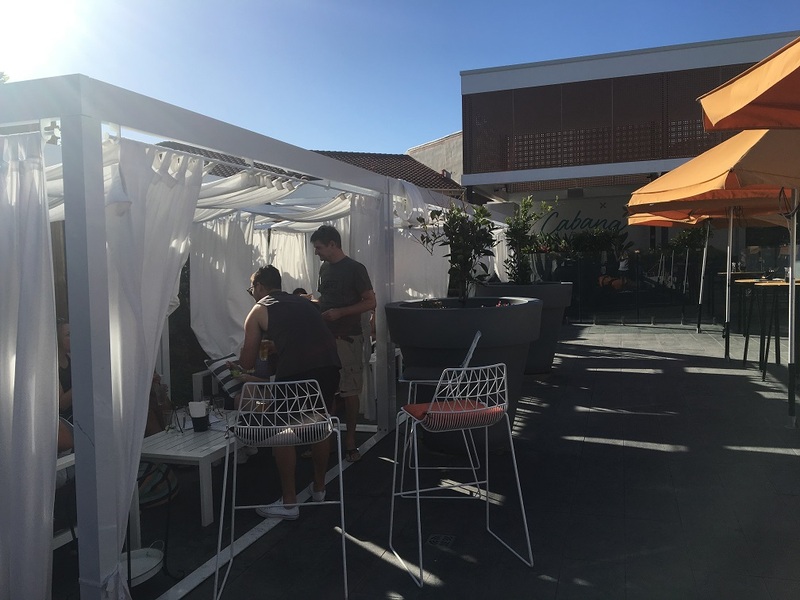 Cabanas are available to book - you need to talk to the Events Coordinator to book, however essentially you pay a minimum spend to book a cabana, this then comes off your food and drink purchase. 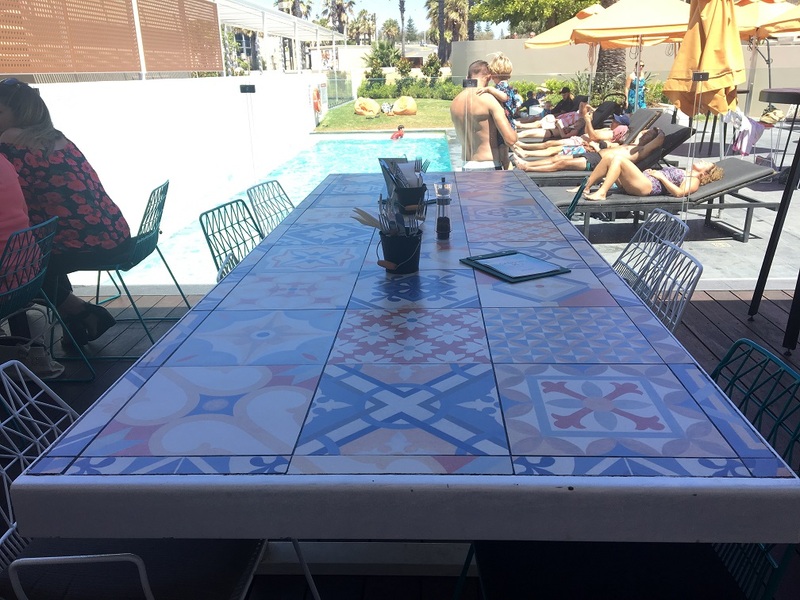 The minimum spend depends on the time of day and the length of your stay but starts around $200 minimum spend and the cabanas appeared to seat 5 adults comfortably. The bar is located outside the pool area and there is a dining area away from the pool also. There are two menus, a Poolside Menu and a Cabana Menu, so you can choose where you want to dine. The bar includes a full range of wines, spirits, beers (including brews by neighbouring Indian Ocean Brewing Co), cocktails and spirits. Dining around the bar is alfresco style so dining here is a great way to have a break from the pool and the sun. 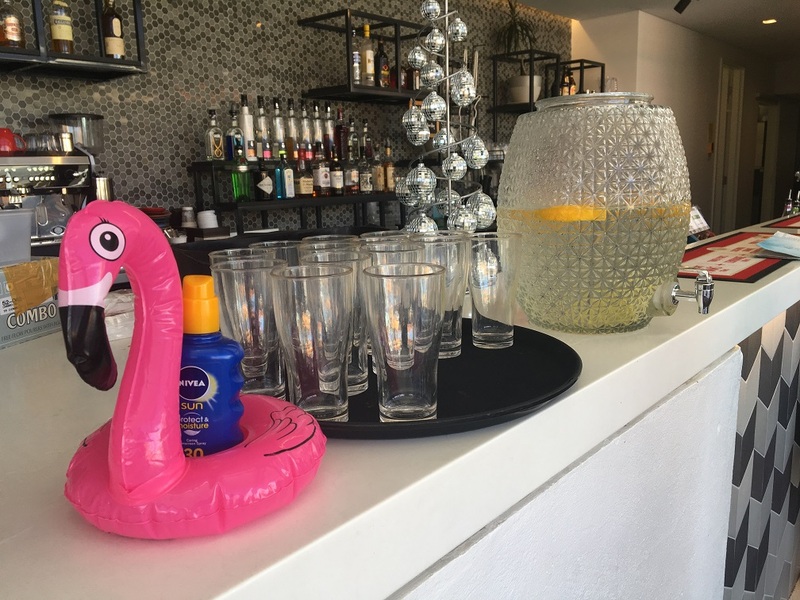 You can help yourself to lemon water from the bar and you can top yourself up with sunscreen here too (but try to remember to bring your own along). We chose to dine by the pool. 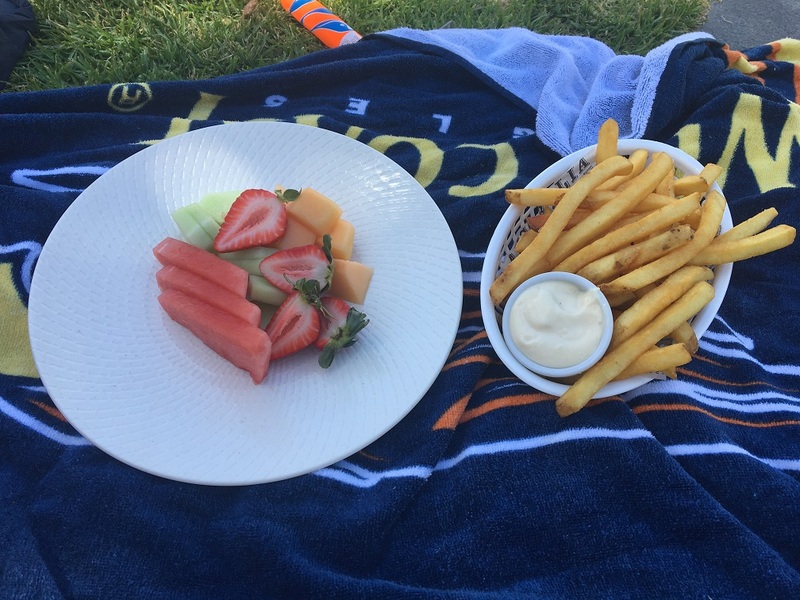 There isn't a kids menu but the Poolside Menu in particular has lots of kid friendly options. We all shared a few rounds of chips, a the fruit plate ($8 each) and the kids chose the Cabana Dog for lunch ($13 - you can ask for the mustard to be left off and for a side of tomato sauce). You can also order ice cream by the scoop for $4. Both menus are available to view on the website (link below). We found the price of food to be very reasonable and everything was brought out very quickly from the kitchen by the very friendly and helpful staff. If you are celebrating a special occasion or just feel like enjoying a cocktail in the sun they have a good range of cocktails to choose from, from $17 each. All drinks are served in plastic glasses by the pool so you can enjoy your drink poolside. 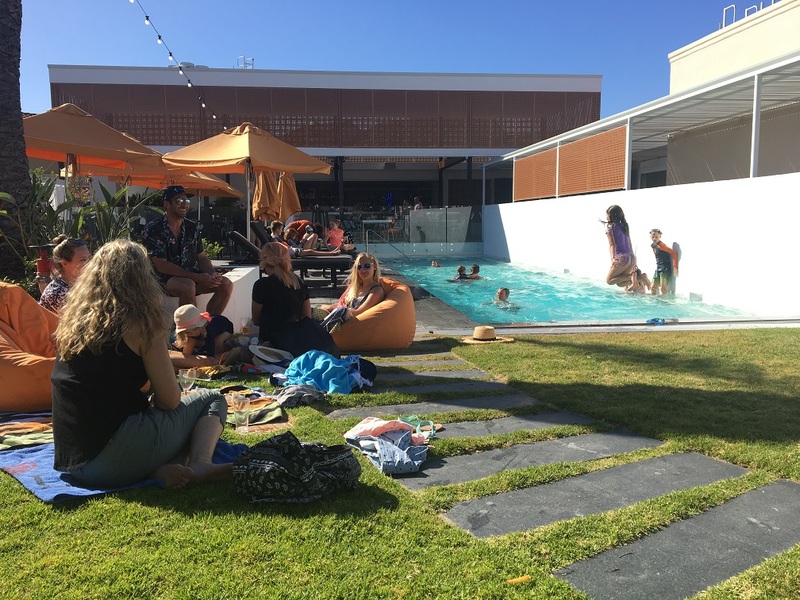 If you are looking for somewhere to enjoy some grown up time with the kids in tow or somewhere to meet with friends, whether it be for a couple of drinks and an ice cream or somewhere to enjoy a full lunch or dinner and a swim, The Cabana Pool Bar and BBQ Mindarie can be whatever you want to make of it. One thing is for sure it is a relaxed and affordable way time to spend time with family and friends on a sunny day and a great way to get some Bali feels without getting out your passport. 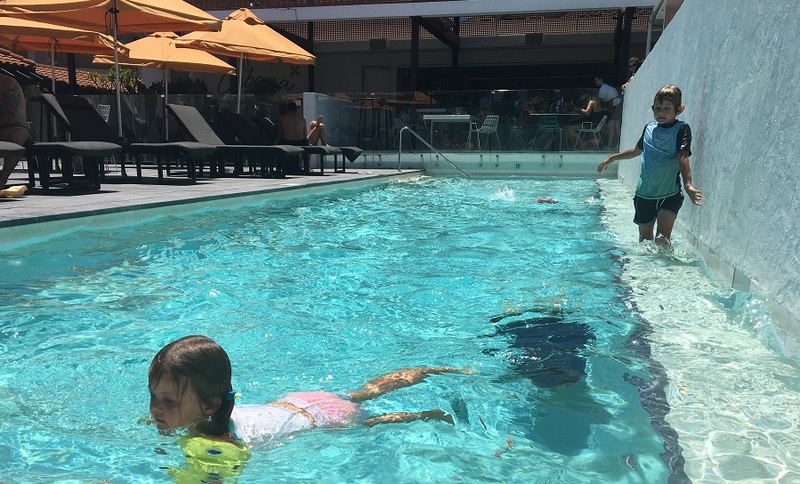 Kids Around Perth supports responsible drinking, please ensure your children are closely supervised by the pool and that you designate a non-drinking driver. Free water is available at the bar. 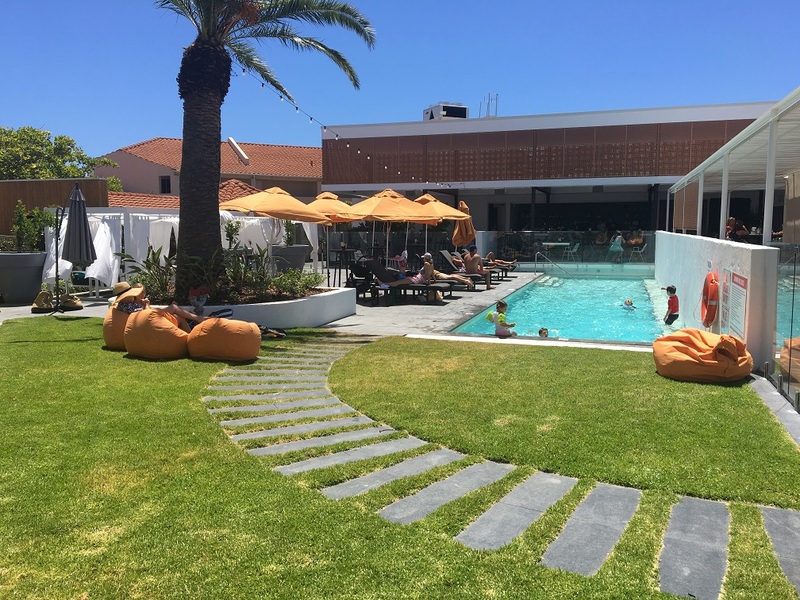 Note: we highly recommend you check the Cabana Pool Bar and BBQ facebook (link below) before you go in case it's booked out for special events or to check if there are adult events on.